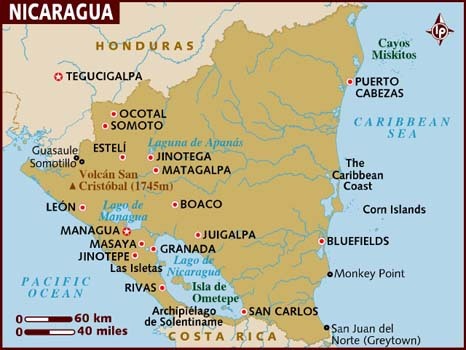 Nicaragua is located in the heart of Central America, bordered by Honduras to the north, Costa Rica to the south, the Pacific Ocean to the west and the Caribbean to the east. The blend of Spanish and Indian cultures have created an interesting and colorful country. There is much to experience in Nicaragua, from the beautiful Colonial cities, numerous volcanic parks, arts and crafts markets, abundant wildlife, sunny beaches, friendly people and great opportunity for adventure. Come and visit this wonderful country, they await you with open arms!